These Garlic Parmesan Smashed Potatoes are crispy on the outside, tender on the inside, and loaded with flavor. 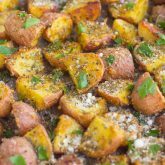 A savory garlic butter mixture coats the potatoes and then they’re roasted to perfection, with a sprinkling of Parmesan cheese. Easy to make and even better to eat, this is sure to become a favorite side for dinner! You know what makes a great form of therapy when you’re feeling stressed? As I was whipping up these Garlic Parmesan Smashed Potatoes in my kitchen a while back, I couldn’t help but enjoy the smashing technique to get these into form. While it only took a minute or two at that, I never realized how fun smashing can be! Seriously though, it was fun. It’s the little things in life that make you happy, right? And being in the kitchen is my therapy. It puts me in a good mood, gets my mind off of whatever is bothering me, and is my creative outlet. It’s my happy place and I wouldn’t have it any other way. What about you? Do you have a happy place like that? Somewhere you can go forget about your problems and let your creative energy shine? I’d love to know! But now, let’s get to to the star of the show, because I can’t wait to talk about my new favorite kind of potato. There’s just something about crispy, baby potatoes that always puts a smile on my face. Sure, I love mashed potatoes with the best of them (especially these Slow Cooker Garlic Parmesan Mashed Potatoes), but I absolutely hate peeling potatoes! It’s the reason why I hardly ever make mashed potatoes, unless it’s warranted by a comfort dish that calls for mashed potatoes, or from the hints of a mashed potato-loving husband. But, with baby potatoes, there’s no peeling involved, and that automatically makes me happy. 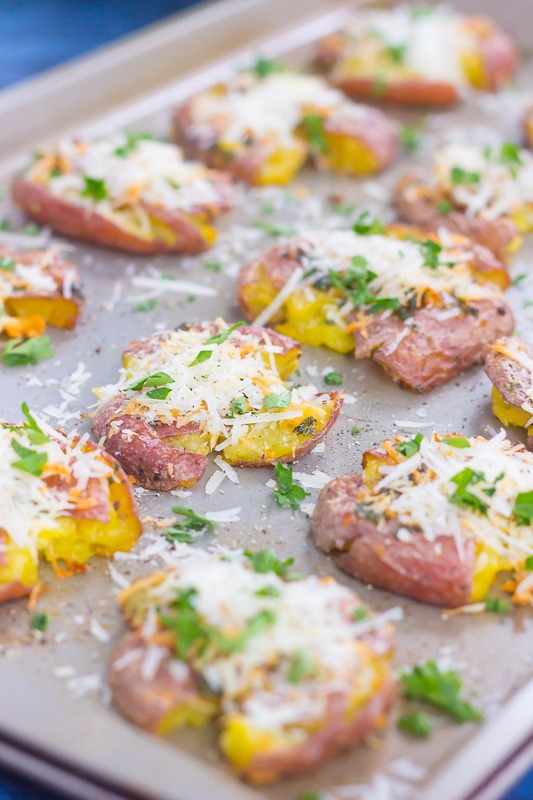 Just roast them them to perfection (like these Herb Roasted Potatoes) or, in this case, smash them! And you know me…I’m all about garlic parmesan anything. In fact, I’m thinking of starting a separate category on my site just for garlic parmesan recipes! Only kidding…sort of. I just love the flavor combo! I mean, this Garlic Parmesan Gnocchi with Mushrooms, that Roasted Garlic Parmesan Broccoli, these Baked Garlic Parmesan Potato Wedges, and this Garlic Parmesan Pasta with Spinach and Mushrooms are just naming a few of the garlic parmesan recipes that I have on Pumpkin ‘N Spice. I think it’s safe to say I’m addicted to garlic parmesan anything, right? So if you’re practically addicted to this flavor combo like I am, then these easy Garlic Parmesan Smashed Potatoes were made for you! 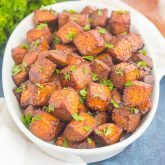 Crispy, yet tender, and loaded with flavor, this will become your new favorite way to eat potatoes! 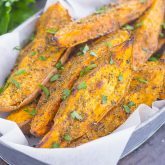 Looking for more easy side dishes? I’ve got you covered! These Garlic Parmesan Smashed Potatoes are crispy on the outside, tender on the inside, and loaded with flavor. A savory garlic butter mixture coats the potatoes and then they're roasted to perfection, with a sprinkling of Parmesan cheese. Easy to make and even better to eat, this is sure to become a favorite side for dinner! Place potatoes in a large pot filled with water. Bring to a boil and cook until fork-tender, about 15-20 minutes. While potatoes are boiling, preheat oven to 450F. Line a large baking pan (may need two pans) with parchment paper or grease well with non-stick cooking spray. Once potatoes are ready, place in an even layer on prepared pan. Using the bottom of a glass (my preferred method) or a potato masher, gently smash potatoes, but keep each potato in one piece. Set aside. In a small bowl, combine melted butter, garlic, and parsley. Brush mixture over smashed potatoes. Season potatoes with salt and pepper. 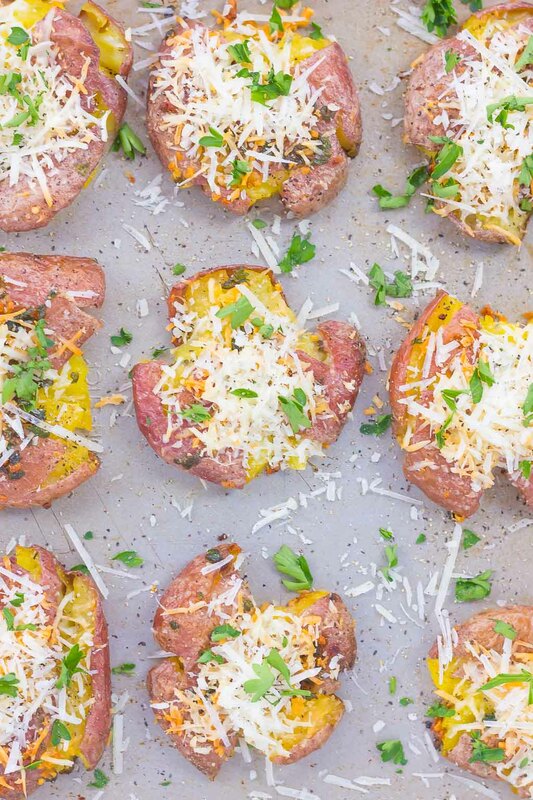 Bake for 14-16 minutes, then remove from oven and sprinkle each potato with shredded Parmesan cheese. Heat oven to a medium broil, position oven rack near top, and broil potatoes until cheese is melted and crispy, about 3-5 minutes. Remove from oven and top with additional Parmesan cheese and parsley, if desired. Haha - yes, a great way to relieve any stress, lol. 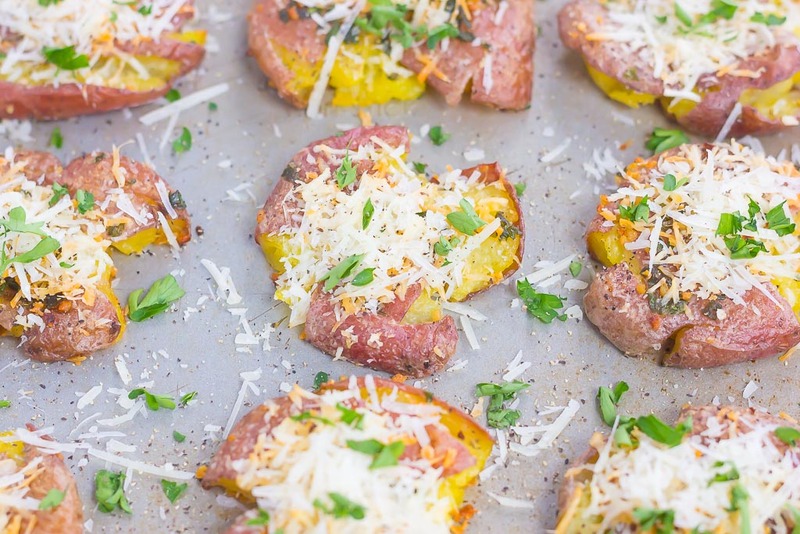 I love smashed tatos - with all those crispy bits. And then smothered in parm? What's not to love? I could make a meal out of just these (or even for breakfast with an egg). Pinned! Happy Monday! Thanks for the potato love and pin, Dawn! It sure is! :) Thanks, Sarah! Thanks, Marcie! I love chopping veggies too...and that's perfect for your soups! Simple ingredients, easy to prepare, and all of our favorite flavors! These sound delicious, Gayle!!! Thanks, Mira! I need to make these more often too! 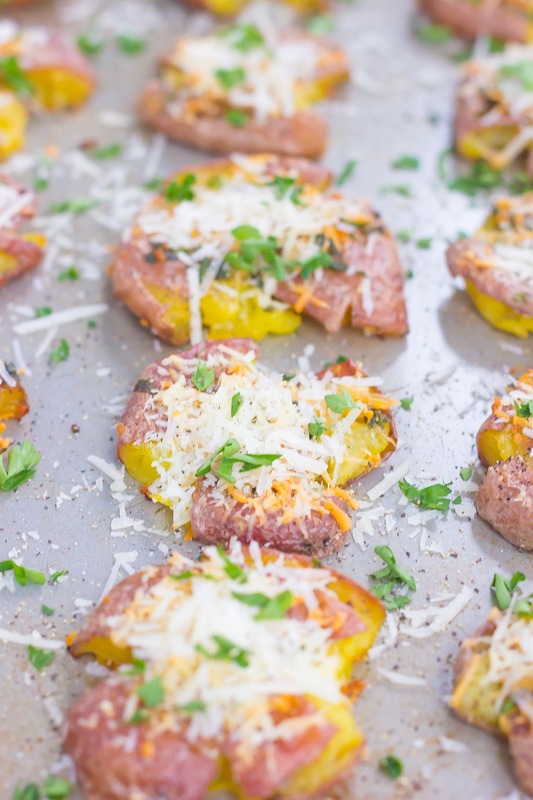 I LOVE me some potatoes ... and yet I've never made smashed potatoes! haha It's a travesty I tell you :) These sound delicious!! Smashed potatoes are the best! Thanks, Ashley! This is such an easy recipe, but I have never tried it. The kids will definitely love it. I think you will love this! Thanks for the kind words and for stopping by!